India emerged as one of the leading nations signing the Paris Agreement in 2015. However, not a single plan until late 2016 acknowledged climate change as a phenomenon, let alone a challenge to urban development and sustenance, Mahak Agarwal writes. The first issue with the state’s approach to climate action in India is that it fails to specify coverage and metrics of the emissions intensity target in its INDC. The second issue is lack of coherent action and monitoring between different ministries working in different capacities to achieve targets marked with India’s INDC. The Third issue – which could have a domino effect to entire efforts and financial resources put together at the Centre ­– is limited or complete absence of climate action at urban level. The urban level is rapidly expanding spatially and numerically and significantly, is the contributor of over half of country’s emissions. Great proposals, policies and programmes are being formulated at the Centre, and some states are taking action as well, but at city level, efforts remain minimal. Urban planners and their efforts to climate action remain silent. Plan documents, often a master plan or comprehensive plan or a strategic plan, fail to even acknowledge the global phenomenon. Majority of documents do not even mention the word climate in their notified document. There exists a relationship between GHG (greenhouse gas) emissions and the urban centre’s population, location, area, sprawl and expansion (extent) as hypothesised and proven in the last such study which dates back to the year 2011 but only uses data from the year 2000. In the Indian context, only a limited number and scope of studies have been conducted by a few agencies and organisatoins, including the Energy and Resources Institute (TERI) and the World Bank Organisation. A plethora of documentations can be accessed on pollution, deforestation, land use- land cover change or climate variability. But only a few of them look at multiple dimensions and relations that exist between cities and climate change. One such effort includes a study published in 2011 examining patterns of greenhouse gas emissions from urban centres in India. The study is based on Emission Dataset for Global Atmospheric Research (EDGAR) for estimating urban share of national GHG emissions. The dependent variables of the research include emissions from 14 source activities, which includes agriculture soil, agriculture wastes, aviation, energy, fossil fuel fires, fugitive escapes from solids, industry, livestock, navigation, non-road transport, oil and gas production, residential, road transport and waste. It indicates that urban centres in India have a close relationship with urban population (as indicated in Table 1) as well as its size, location and extent (as indicated in Table 2). The study notes that although small and medium towns are the largest emitters of greenhouse gas emissions in India, the problem is much severe for mega cities since only 53 cities out of 7,935 urban centres account for more than 18 per cent of country’s total emissions. Comparing the emissions with urban extent, the study indicates that despite the small number of mega cities, their location and extent, have a major role to play in determining share of total greenhouse gas emissions. Thus, mega cities are the biggest culprit when it comes to producers of climate change (as illustrated in Fig. 1 wherein top 25 emitters in the country are visualised against their share of urban population). These also happen to be the largest hotspots of climate risks, as they inhabit larger share of total urban population. To sum it up, amongst Indian cities concerning climate change, the cohort of mega cities are the largest culprits, with the capital city of India- National Capital Territory of Delhi being the prime offender. 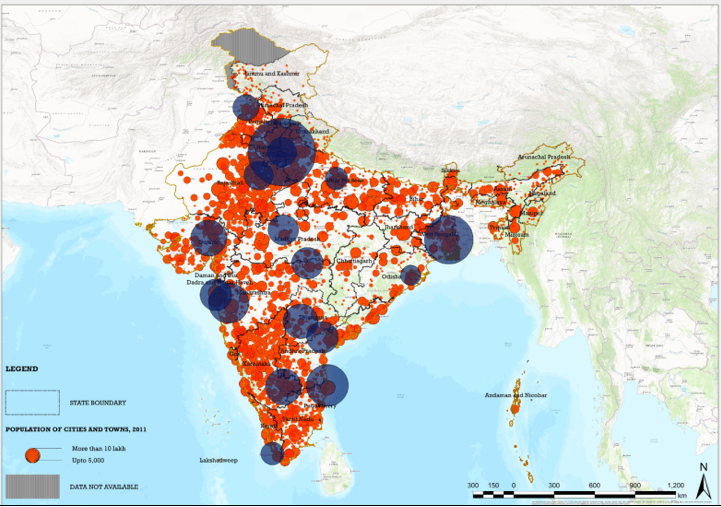 India has around 8,000 urban centres, while only 120 of them have a development plan of some sort, which means not all of these plans are statutory or meant for implementation. In an assessment by the author of the 120 master plans, city development plans, smart city plans, and such others, it is construed that not a single plan till late 2016 acknowledged climate change as a phenomenon, let alone a challenge to urban development and sustenance. It is further accentuated by limited scope of climate knowledge in urban planning, restricted to disjointed focus on mass transit, environment protection or curbing and management of air pollution and emissions. It can be noted that even the Master Plan of Delhi, which is believed to have been a guiding document for several other cities since 1950s, fails to mention the term climate or climate change, let alone identify it as a challenge to urban development. With stewardship of government at the Centre by Prime Minister Narendra Modi, climate change and initiatives by India were applauded at the Conference of Parties 21, held in Paris, France in 2015. Several bold statements are made at the Centre and it is a novel effort after the 1970s, when for the first time India took special interest in environmental sustainability at international platforms. Decades later, the environment in cities is deteriorating for all at the sake of economic prosperity for a select few. The requisite actions to address urban climate change are yet to trickle down for urban centres, despite being perpetual polluters and pump houses of emissions.